Mucormycosis is an acute opportunistic infection caused by saprophytic fungus of class Phycomycetes order Mucorales and family Mucoracae, found in soil, bread molds, and decaying fruits and vegetables. Even though this fungus is ubiquitous in the nature, the disease is usually prevented by immune system and is therefore rare. Rhizopus, Rhizomucor, Absidia and Cunninghamella are the most common species associated with Mucormycosis. Diabetes, chronic kidney disease, desferroxamine use in dialysis, leukemia, lymphoma, immunocompromised state, burns and open wounds are the risk factors of mucormycosis. Out of six clinical entities of mucormycosis, rhinocerebral mucormycosis is the most common variety which includes three subtypes rhinomaxillary, rhino-orbital and rhino-orbitocerebral mucormycosis. Here are two case reports of Rhinocerebral mucormycosis of different subtypes emphasizing the role of early detection of the disease to limit the spread of infection and reducing the morbidity and mortality. Mucormycosis is an angioinvasive mycosis with high morbidity and mortality rates that predominantly occurs in immunocompromised patients. It was first described by Paultauf in 1885. Mucormycosis is an acute opportunistic infection caused by saprophytic fungus of class Phycomycetes order Mucorales and family Mucoracae, found in soil, bread molds, and decaying fruits and vegetables. Most common species associated are Rhizopus, Rhizomucor, Absidia and Cunninghamella. The term rhinocerebral mucormycosis (RCM) is used if the facial, palatal, orbital, paranasal sinus or cerebral regions are involved and the patients generally present with signs and symptoms primarily located in these regions. Rhizopus is the predominant pathogen, accounting for 90% of the cases of RCM. The three subtypes of RCM are rhinomaxillary, rhino-orbital and rhino-orbitocerebral mucormycosis. 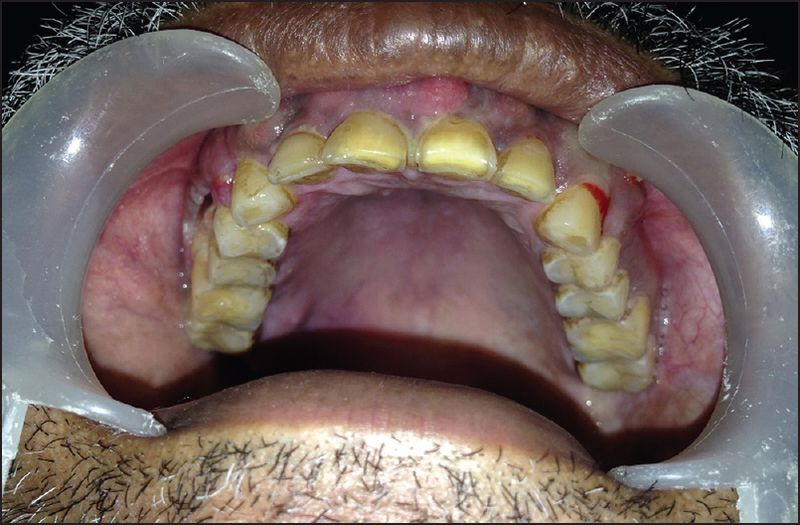 A 48-year-old male patient had a chief complaint of pain in the upper right back teeth region since 1 month and swelling of right side of face since 20 days. He was a known diabetic for 10 years. On extra-oral examination a mild diffuse swelling was seen on right side of the face. On intraoral examination chronic generalized periodontitis with multiple periodontal abscesses was present [Figure 1] with generalized mobility of teeth in the upper arch and recession with bone exposure and oro-antral fistula in the region of 15 and 16. 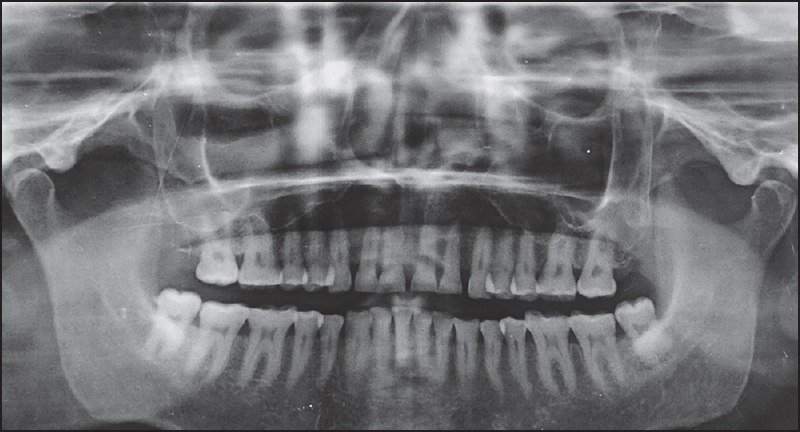 Provisional diagnosis of osteomyelitis of maxilla in the region of 15 and 16 was considered. Investigations showed increased blood sugar levels (FBS 158 mg/dl, RBS 226 mg/dl), which gave a clue for considering mucormycosis in the differential diagnosis. Orthopantomograph (OPG) showed haziness of right maxillary sinus (maxillary sinusitis was considered in differential diagnosis) [Figure 2]. 3D computed tomography (CT) showed destruction of part of antero-inferior wall of maxillary sinus in the region of 15 and 16 [Figure 3]. 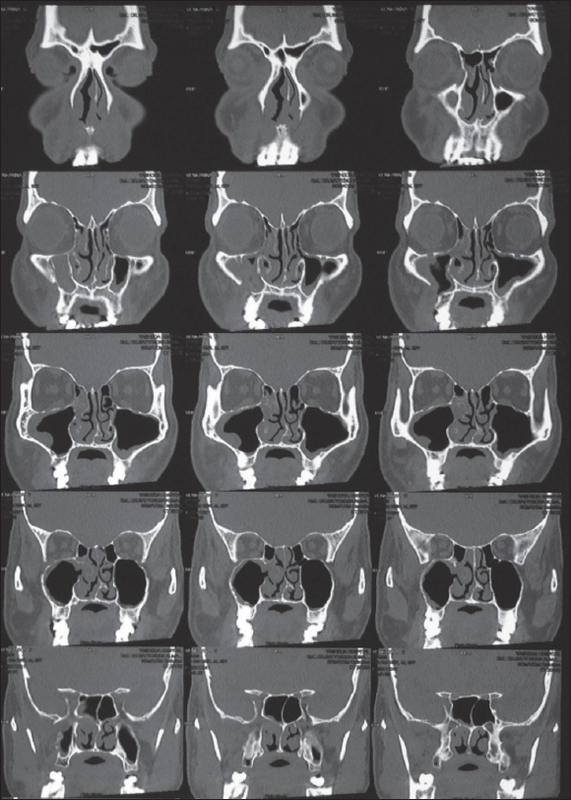 CT showed pansinusitis on the right side with mucosal thickening [Figure 4] and [Figure 5], discontinuity of part of antero-inferior wall of right maxillary sinus and destruction of part of right alveolus with antral communication [Figure 6] (osteomyelitis and malignancy were considered in the differential diagnosis). 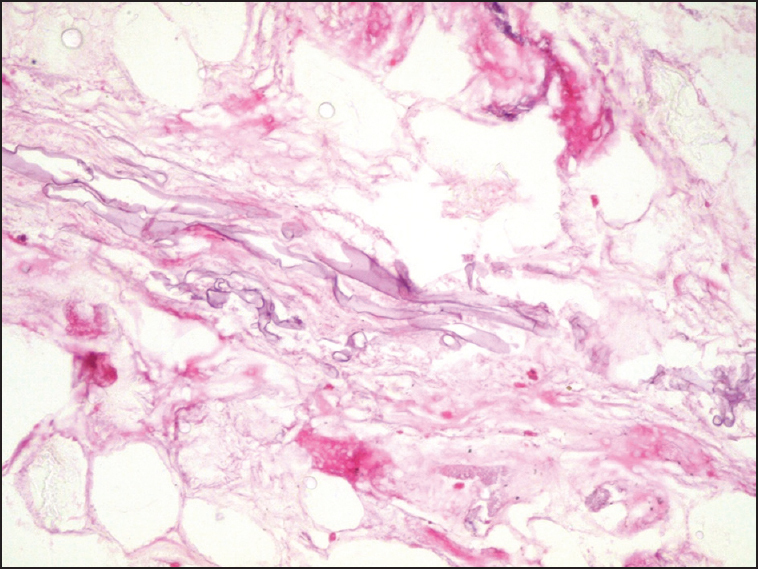 Histopathological findings (HP) included broad non-septate fungal hyphae along with necrosis of the tissue [Figure 7]. Final diagnosis of rhinomaxillary mucormycosis (RCM) was considered as maxilla, associated sinuses and nasal fossa of right side were involved. The patient was kept under human mixtard insulin (SC), liposomal amphotericin B (IV 50 mg with 5% dextrose) and antibiotics for 1 week and later planned for surgery under GA. Debridement of maxillary sinus, correction of deviated nasal septum and complete extraction of teeth in maxillary arch except 26 and 27, irrigation and suturing were done [Figure 8]. 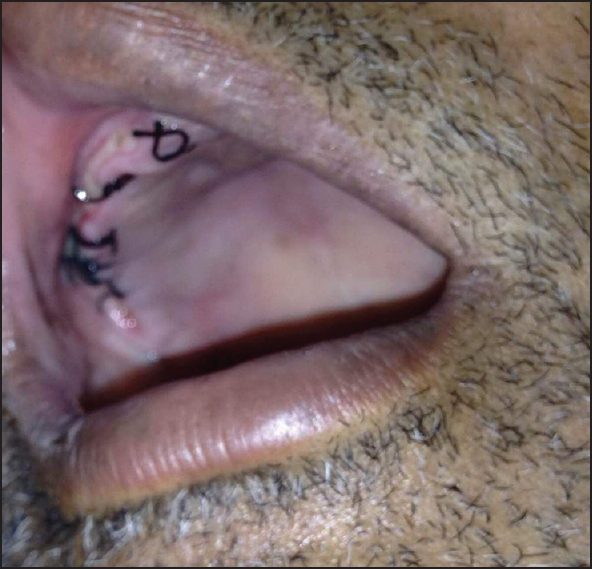 A 50-year-old female patient complained of pain and ulcer in the mouth since 3 months and passage of fluids from mouth into nose since 1 month. She was a known diabetic for 15 years with chronic kidney disease and a paralytic attack 3 months back. On extra oral examination, asymmetry with mask like face on the right side was seen. On intraoral examination bone exposure extending up to midline of the palate with palatal perforation and pathological fracture from 11 extending posteriorly up to 18 with missing 12 and chronic generalized periodontitis were seen [Figure 9]. Provisional diagnosis of fungal osteomyelitis was considered. On investigation patient was anemic (Hb- 9g%) with poorly controlled diabetes mellitus (Hb A1c- 8.2%) and increased serum creatinine (3.9) levels. The OPG showed irregular destruction of bone in the region of 13, 14, 15, 16 with haziness of right maxillary sinus [Figure 10] (malignancy and osteomyelitis were considered in radiographic differential diagnosis). 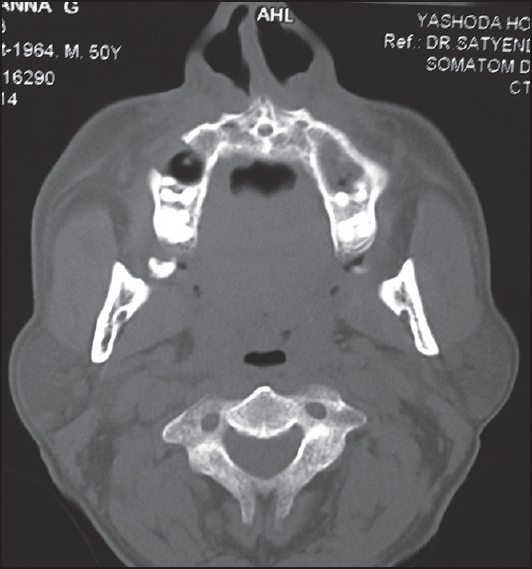 The CT findings included mucosal thickening of all maxillary, ethmoidal and sphenoidal sinuses on the right side [Figure 11] (Pansinusitis was considered under the differential diagnosis). 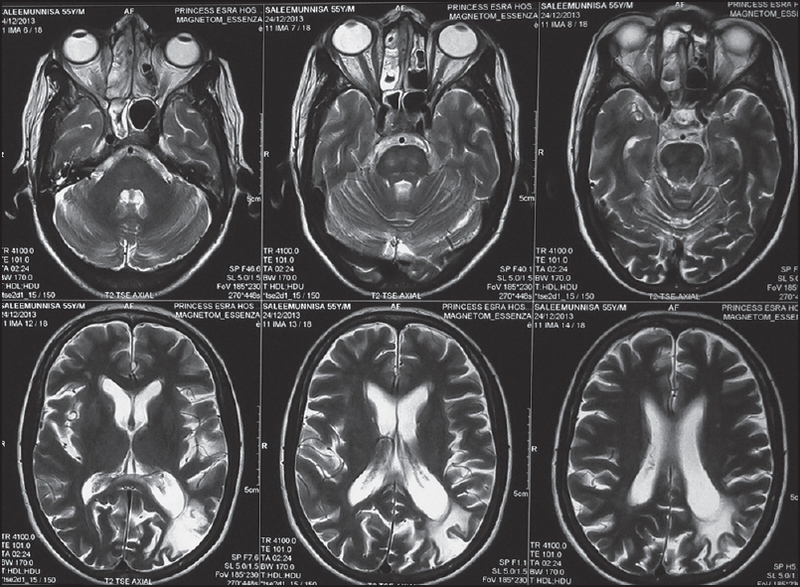 Magnetic resonance imaging (MRI) showed infarct with encephalomalacia in the left parietal lobe abutting the sylvian fissure, and right maxillary, ethmoidal and sphenoidal sinus opacification extending into the right orbit with compression of optic nerve [Figure 12]. Nasal swab sent for KOH mount direct microscopy was positive for fungal elements. HP findings showed necrotic tissue with numerous bacterial colonies, necrotic vascular tissue and fungal elements including broad, pauciseptate, and ribbon-like non-parallel wall hyphae suggestive of mucormycosis [Figure 13]. Final diagnosis of rhino-orbitocerebral mucormycosis was established as sinuses, nasal cavity, orbit and cerebrum were involved. The patient was administered antifungal drugs (itraconazole 100 mg BD), antibiotics and human mixtard insulin therapy (SC) for 4 weeks after which the nasal swab culture was negative for fungal elements and microscopy on KOH mount too was negative. Patient had poor prognosis for surgical resection because of anemia, age criteria, uncontrolled diabetes, chronic renal disease and cerebral involvement. Surgery was not performed as the patient was not willing for the surgery. She is under follow up. Studies have shown that diabetes mellitus alters the immunologic capability to resist mucormycosis through reduction of the phagocytic ability of granulocytes. In addition, Rhizopus species thrive best in an acidic and glucose-rich environment. 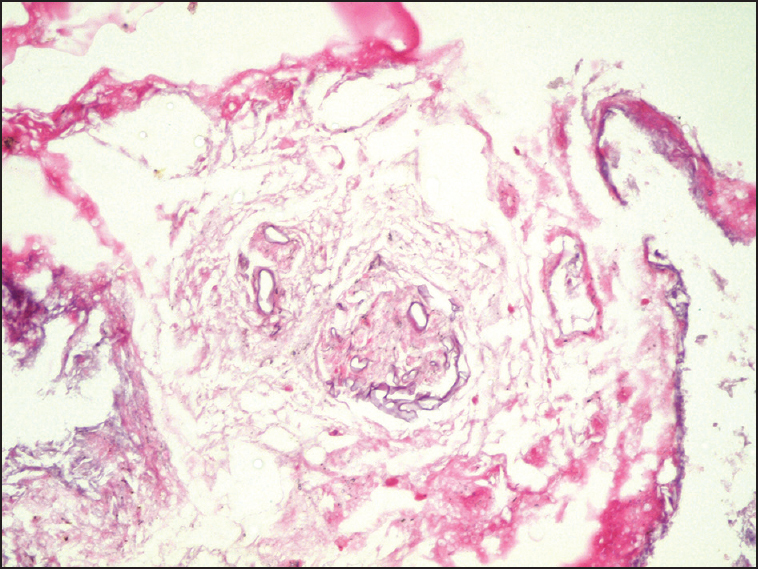 Mucormycosis often invades blood vessels; thrombosis, infarction and necrosis are the major characteristics. Differential diagnosis includes aspergillosis, histoplasmosis, paracoccidioidomycosis, cryptococcosis (lungs contain foci of infection in addition to oral lesion), malignancy (features of malignancy such as induration, bleeding, paresthesia, metastasis, association with habits were not present in the present case), sinusitis (bone involvement in the present case made us to consider osteomyelitis especially RCM and other fungal infections which has association with osteomyelitis) and Gumma. 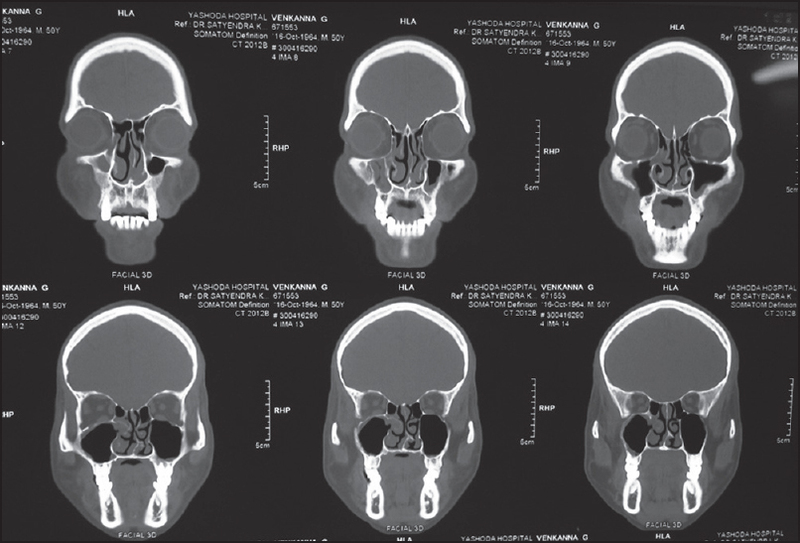 Cavernous sinus thrombosis is a serious complication of maxillary infections. A definitive diagnosis of mucormycosis can only be made by a biopsy and culturing the fungus in the laboratory. Histologically, mucormycosis is characterized by extensive tissue necrosis, large fungal hyphae, which are nonseptate and have a ribbon-like appearance, with budding and dichotomous branching. In the present cases nonseptate hyphae with tissue necrosis were present which helped in confirmation of the diagnosis. The initial medical approach to mucormycosis is to treat aggressively any underlying predisposing disorder. Surgical management also should be initiated early in the course of treatment. This should involve debridement of all infected tissues, which was done in the first case. The same treatment was proposed by some others according to which early antifungal and surgical treatment has good prognosis in early cases but patients with cerebral involvement had poor survival rate even after antifungal and surgical debridement. There was poor prognosis in the second case because of cerebral involvement. In some cases, radical resection may be required. The use of amphotericin B in patients with mucormycosis has been a widely published and accepted treatment, with a survival rate of up to 72%. Although combined treatment of surgery and amphotericin B has a survival rate of 80%, 70% of those who do survive will encounter some type of functional deficit. In one of the present cases liposomal amphotericin B was used for the treatment which is the antifungal drug of choice for the treatment  of mucormycosis in combination with surgical debridement. Itraconazole and posaconazole are antifungal drugs which acts by inhibiting ergosterol synthesis. In the present case one case was treated by administering itraconazole. Hyperbaric oxygen (HBO) helps in treatment by reducing tissue hypoxia and acidosis caused by vascular invasion of the fungus. , Rifampin  and anticoagulants  has also been used to treat RCM in various studies. The present cases reinforce the concept that awareness and knowledge of potentially fatal complications may help in rapid diagnosis and prevention of disease dissemination. Early aggressive therapy to prevent cerebral involvement by this severe infection provides the best chance for a good outcome. Parfrey NA. Improved diagnosis and prognosis of mucormycosis. A clinicopathologic study of 33 cases. Medicine (Baltimore) 1986;65:113-23. Ferguson BJ, Mitchell TG, Moon R, Camporesi EM, Farmer J. Adjunctive hyperbaric oxygen for treatment of rhinocerebral mucormycosis. Rev Infect Dis 1998;10:551-9. Lador N, Polacheck I, Gural A, Sanatski E, Garfunkel A. 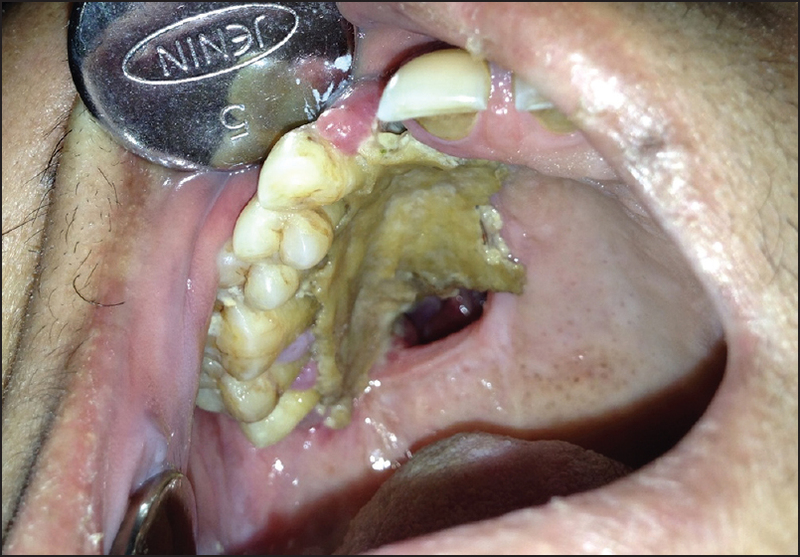 A trifungal infection of the mandible: Case report and literature review. Oral Surg Oral Med Oral Pathol Oral Radiol Endod 2006;101:451-6. McNulty JS. Rhinocerebral mucormycosis: Predisposing factors. Laryngoscope 1982;92:1140-3. Tierney MR, Baker AS. Infections of the head and neck in diabetes mellitus. Clin Infect Dis 1995;9:195-216. Sugar AM. Mucormycosis. Clin Infect Dis 1992;14:126-9. Sapp JP, Eversole LR, Wysocki GP. Contemporary Oral and Maxillofacial Pathology. St Louis: Mosby; 1997. p. 237-48. Nussbaum ES, Hall WA. 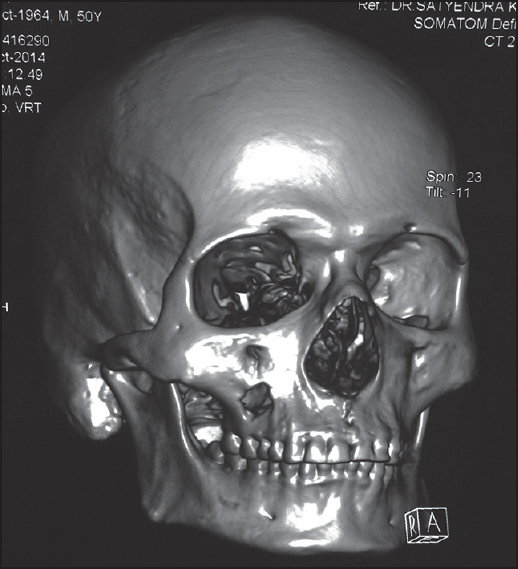 Rhinocerebral mucormycosis: Changing patterns of the disease. Surg Neurol 1994;41:152-6. Spellberg B, Walsh TJ, Kontoyiannis DP, Edwards J Jr, Ibrahim AS. Recent advances in the management of mucormycosis: From bench to bedside. Clin Infect Dis 2009;48:1743-57. Kajs-Wyllie M. Hyperbaric oxygen therapy for rhinocerebral fungal infection. J Neurosci Nurs 1995;27:174-81. Christenson JC, Shalit I, Welch DF, Guruswamy A, Marks MI. Synergistic action of amphotericin B and rifampin against Rhizopus species. Antimicrob Agents Chemother 1987;31:1775-8. Price DC, Hameroff SB, Richards RD. Cavernous sinus thrombosis and orbital cellulitis. South Med J 1971;64:1243-7.